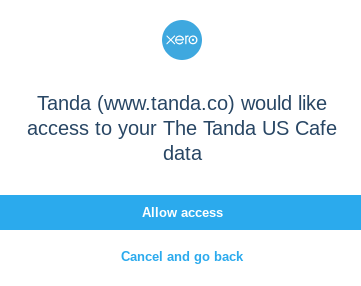 You can check out this information guide for any specific instructions for using Xero (USA) in Tanda, including setting up the integration, importing staff and exporting Timesheets. Currently, Leave Balances are unable to be automatically imported or Leave exported from Tanda to Xero. A pop-up will then display asking you to login to Xero (if you're already logged into Xero in another tab, you'll go straight to the authorize screen). Enter your login details for Xero and click Login. Click on the Xero organization name to select the Integration. If you only have one file attached to Tanda, you'll just see one box however if you have more than one just click on the one you want to import from first. If one or more staff didn't import, check their details in Xero to ensure you have added them, they have a current start date and don't have a finish date. Use Employee Onboarding: this sends the new employee an App to fill in their details and a profile will then automatically be added to Tanda and you can use the information to create their profile in Xero. Once you're finished adding staff, you might want to look at Adding Locations & Teams, Welcome Staff or Build your first Schedule.